If you’re anything like me, your car dashboard is a witness to all manner of suction cup-based clamps and holders providing support to mobile phones, digital radios and satnav units, all vying for space within my near-eye-line without causing a loss of attention to the road! My satnav unit is probably the one I would be happy to get rid of, if it weren’t so damned useful. The problem with it is that it is tricky to interact with, mainly thanks to a poor ABCDEF keyboard (as opposed to the more common QWERTY) and the fact that it uses a resistive touchscreen. What would make discarding this satnav unit much easier is a competent navigation tool for Windows Phone 7 – and there is every chance that the Turn by Turn Navigation app, available exclusively from the Windows Phone Marketplace for $3.99 (or for the less impulsive among you, a free trial can be downloaded) could be the app to solve that particular problem. 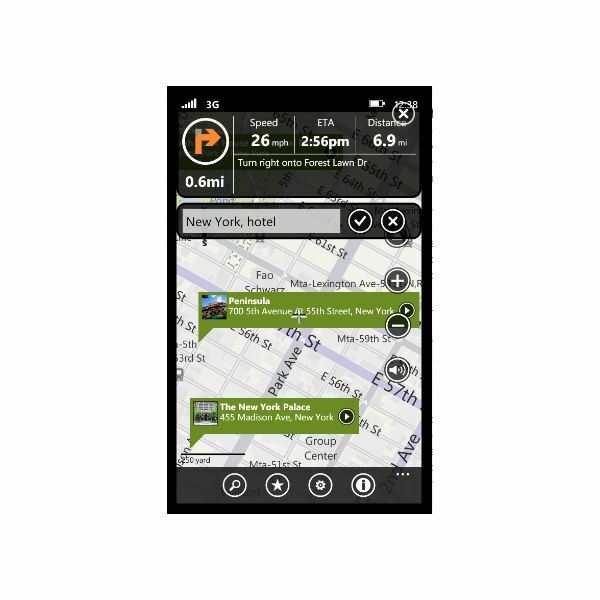 Taking advantage of various localization options in Windows Phone 7, Turn by Turn Navigation allows you to easily create routes to cities and towns across the world. This is done by combining the GPS functionality on your Windows Phone with some cellphone triangulation technology, which is used to determine your current position in relation to your intended destination. Localization options can be a threat to privacy, so when you install this app you will be given the details you need to make an informed decision concerning this matter. GPS on phones can be quite a drain on battery power – after all, it isn’t easy keeping in touch with global positioning satellites several thousand feet in the air – so it is well worth hooking your Windows Phone up to a power source when using this app. 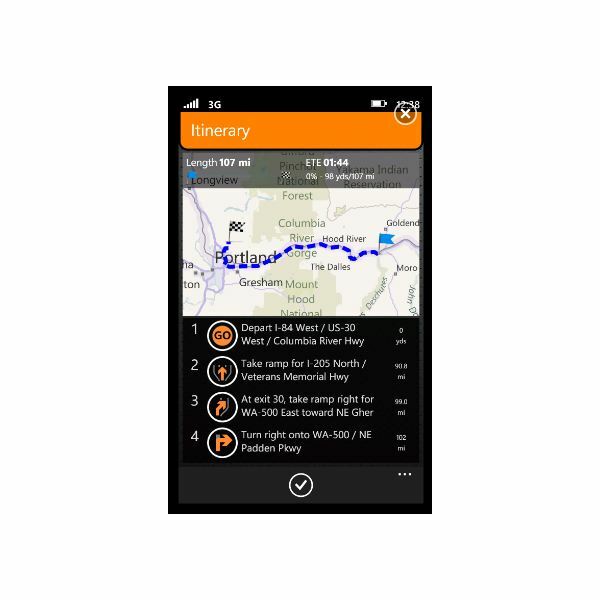 The most important thing for any Windows Phone satnav app needs to be successful is that it is intuitive and easy to use. Often, an app can be reasonably easy to use and be well-regarded, but for an app that needs to accessed while in a car and perhaps driving, simple, basic gestures and options are required. The presentation can be polished up, but a basic interface with the key tools that control adjusting the map and creating routes is very important. Turn by Turn is largely successful in this aim, offering the controls you need to quickly and easily create a new route on the main map screen alongside data concerning your current speed, the direction to take at the next junction and other useful controls. In addition, the app’s big selling point – a human female voice instructing you on the route to take – is easily configured via the Settings > Voices screen. There are also some useful options for downloading maps in order to reduce the amount of data transfer that the app employs, useful if you have a low limit on data use. However there is one odd quirk. The app is called Turn by Turn Navigation, yet is listed as Navigation in the Windows Phone apps list – the amount of time spent trying to find this app in the alphabetically-sorted list could prove to be highly frustrating! Providing a clear user interface that details your location, where you’re going and how and when you’re going to get there is a key purpose of any satnav app, and Turn by Turn Navigation certainly succeeds in this aim. It is just so easy to use, from using your finger to scroll around the Bing Maps-provided map to typing in the destination, seeing its flag on the map and tapping this and selecting Go to start the route calculation. Easy zoom tools and a volume mute button are all available on the main screen, while settings and options can be altered via the Settings screen; other options in the ellipses menu allow you to toggle between map and hybrid/landscape view, although thanks to the map source these aren’t as up to date as they might be. Generally, however, this app is easy to use, and thanks to the added bonus of some Internet-provided content for calling phones or visiting websites whenever you search for a route to a particular business, it will keep you coming back for more! 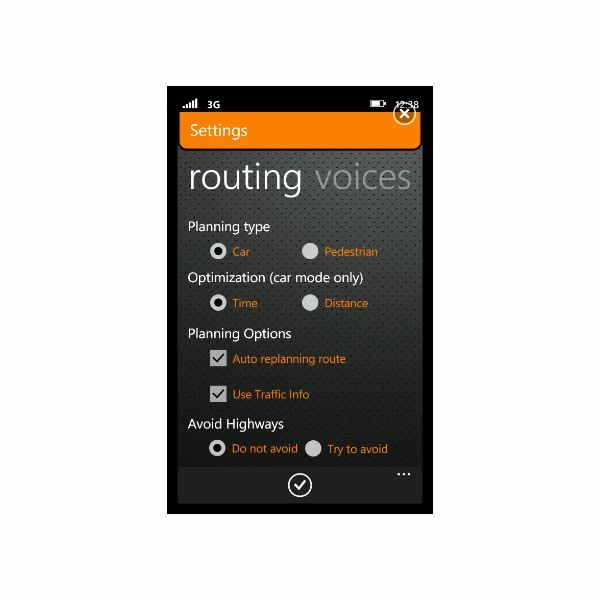 Thanks to useful options that keep the screen active and leave Turn by Turn Navigation running when the Windows Phone 7 screen locks, this is an app that you can use to get from A to B with a pleasing female voice guiding your way without fear of getting lost. Having tried the app to get across town to an unusual address I can safely say that it does what it sets out to do and manages it with some polish and style. 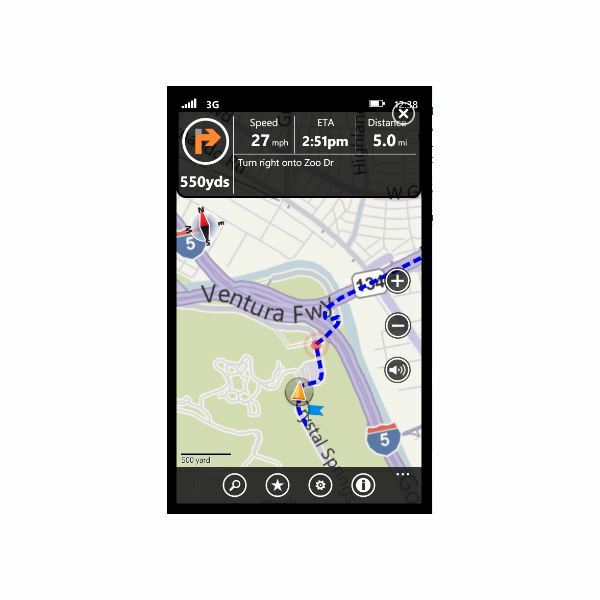 This is an impressive app that is a lot cheaper than a standard satnav system, and thanks to its various sensible features, offline navigation and the fact that it can be used in the USA and Europe, this is likely to become one of the top choices for GPS-controlled satnav on Windows Phone 7! 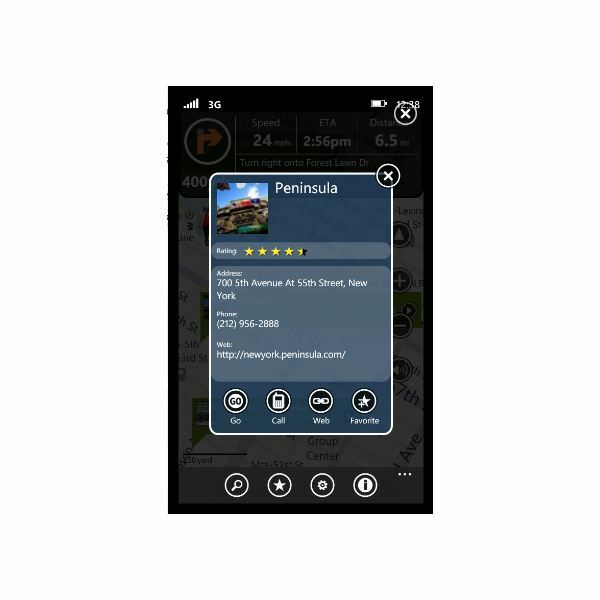 All images and references from the Turn by Turn Navigation app, available from the Windows Phone Marketplace.